We're recruiting for a General Practitioner to come and work in the great city of Townsville, located in the state of Queensland. The practice strives to offer the perfect work/life balance. Hours are flexible, approximately 40 hours per week during the practice opening hours of 7.00 am – 8.00 pm Monday to Friday, Saturdays 7.00 am - 3.00 pm and Sunday 7.00 am - 1.00 pm. You will be treating patients of all ages and backgrounds, with a wide variety of general practice type conditions, including medical, paediatric, dermatological, antenatal and postnatal care, surgical and work injuries. You will receive 65% of your billings which will equate to an income of $250,000 - $350,000 dependent upon your span of hours, and in the first few months you will receive an income of $100 p/hour or your % of billings whichever is the greater. You will also be provided with accommodation for a month after arriving. With more than 320 days of sunshine each year, World Heritage-listed national parks and lush tropical gardens, Townsville is home to some spectacular natural landscapes and attractions. Townsville is a major gateway to the Great Barrier Reef, the Wet Tropics and the Queensland outback. It’s a vibrant and bustling city sitting under the watchful gaze of Castle Hill. Enjoy alfresco dining, Federation-style architecture and boutique shopping, as well as the cooling ocean breeze and coastal vibe. It’s also Australia’s largest garrison town with Australian Defence Force bases and fascinating military history to explore. 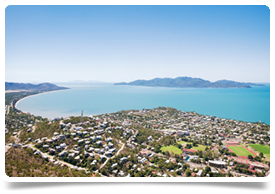 Townsville is located about 350 kilometres (218 miles) south of Cairns and 1350 kilometres (839 miles) north of Brisbane. Townsville Airport has links to major eastern seaboard cities, as well as Darwin, Bali and some Queensland regional inland towns. From the airport it's a 10 minute drive to the city centre.